Mahek's cookery classes specially caters to women from all walks of life. The classes are designed for beginners and experts as well. You can choose and combine courses according to your requirements. The classes are limited to 10 or less students and are conducted on a daily basis. The timings are flexible and we also have weekend batches for working women. Mahek makes sure the environment is friendly and enjoyable. She allows you to cook with her so that you get hands on experience while you learn how to cook. All you need to get along is your enthusiasm and willingness to learn!! Sugarcraft is probably the most misunderstood term. 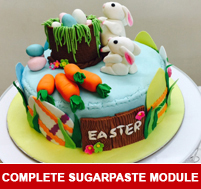 What exactly is sugarcraft? 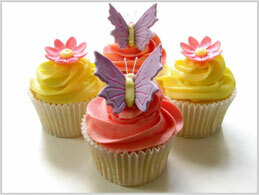 To clear things up a bit, sugarcraft is a type of cake decorating which is three-dimensional. Sugarcraft is decorating that stands out from all other forms of decorating. Sugarcraft is to cake decorating what clay is to sculpting. The type of icing used in sugarcraft, rolled fondant, is a dough, that can be used to cover the cake and making cake decorations. 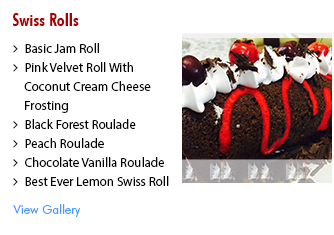 Fondant is rolled into sheets, draped over cakes or to cut to make ribbons, bows, flowers and lots more. In my Cake Baking and Icing class, students are taught how to make the softest sponge cakes, how to pipe out designs with whipped cream and how to assemble and decorate the entire cake from scratch. This class covers all the techniques with fresh cream and chocolate. With just this one class many students have successfully launched their careers in cake baking!! Well, now they want more!! Fondant cakes are very much in demand now and any woman who is confident in her cake baking and decorating skills would definitely want to explore this wonderful medium as well. So with the popular demand from my students and due to their immense confidence and faith in me I too have finally ventured into Sugarcraft. My journey began by finding the right place to train myself first. 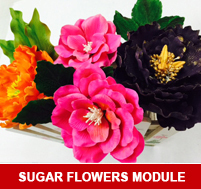 I have done my Masters in Sugarcraft with PME UK, which has 3 modules – 1) SUGARPASTE MODULE; 2) SUGAR FLOWERS MODULE; 3) ROYAL ICING & PIPING MODULE. Besides this, I have also invested a lot of time and effort in learning a lot of different techniques and methods from different sources. This was just to ensure that my students get the best out of me!! Baby Shower Theme, Valentine Theme, Wild Animals Theme, Flowers, Etc. 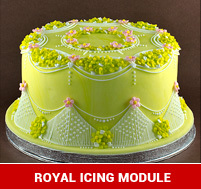 Learn to bake and decorate your cakes with fresh cream icing. Florentines, English Toffee/ Brittle, Cashew Crunch, Almond Crunch, Saffron Pistachio Exotica. Assorted chocolates - In this class all the basic chocolates are taught. You shall get to practise as well. Premium chocolates - This is a little advanced class. Exotic fillings and premium chocolates like English Toffee Brittle, Florentines, Saffron Pistachio Exotica are taught. Gourmet Chocolates - Learn To Make Chocolate Garnishes, Chocolate Fans, Cones, Cigars And Coloured Chocolates. Use Of Chocolate Stencils, Transfer Sheets And Structure Sheets Will Be Taught. Students Will Be Preparing All The Garnishes And Art Work Themselves..
Chocolate Crafting Workshop - Have fun working with chocolate!! Learn how to use modeling chocolate to create figures, flowers, a beautiful red rose, bows, patchwork and a lot of different decorations in just one day. Have fun working with chocolate!! Learn how to use modeling chocolate to create figures, flowers, a beautiful red rose, bows, patchwork and a lot of different decorations in just one day. The professional baking course covers all your baking skills - for sweet as well as savoury. Learn to make your own breads, cookies, croissants, puff pastry, Danish pastry, brownies, cup cakes, muffins, etc. Premium Desserts like Tiramisu, Cheese cakes, Sinfully Divine, which you and your family enjoy in restaurants, can now be made in your own kitchen. There are different classes for each and you can attend any class you choose to. Can bake good cakes but do not know how to decorate them ? Well, the Professional Cake Baking Course takes care of all your fears. 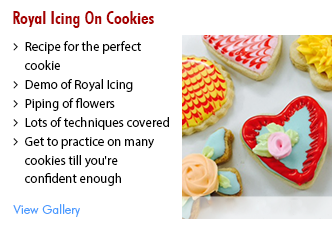 This class covers baking, icing and decoration - making you an expert in just 3 hours. Chocolate - Vanilla - Coffee Stripe, Hazlenut Mousse, Strawberry Mousse, Pineapple . Butter cookies, Cinnamon cookies, Ginger snaps, Coconut cookies, Peanut butter cookies. Tired of serving the same old desserts in all your parties? 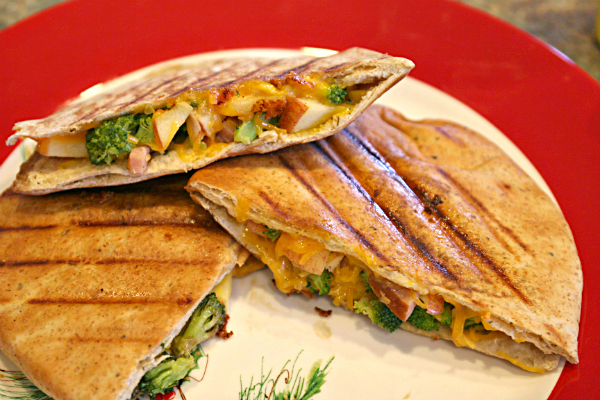 Want to serve something traditional but at the same time different and easy? Tired of serving the same old desserts in all your parties? Want to serve something traditional but at the same time different and easy? Well, this course is just for you. 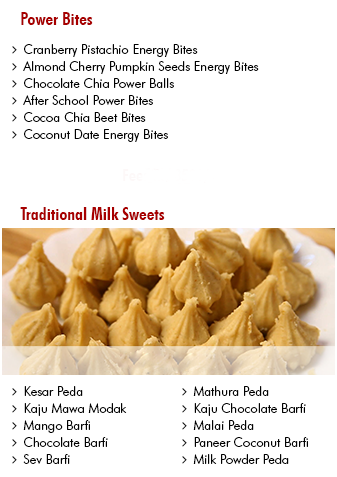 This course includes all your favourite mithais, chikkis, Indian desserts, Christmas sweets, etc. 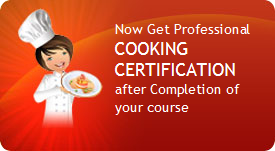 The cooking course has an extensive list of classes. 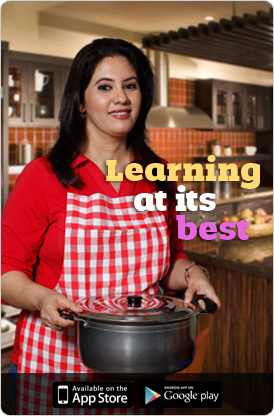 Learn basic cooking in Roz ka khana or update your cooking skills. *Conditions Apply Amount paid once will not be refunded. Classes can be booked category wise only.